Oh, dragon. Someone painted you with such care, but I just can’t keep you. I took photos, so you will not be forever lost (though you will not be appearing on my walls any longer). Fare thee well. That is a very big dragon! It’s pretty neat, but I can see why you would paint over it. It’s so specific, and probably best for a fantasy children’s room. When I bought my house, every single wall in the 2 spare bedrooms and the bathroom were murals. Very well done but not an inch of it was unpainted. I required them to paint over it before I would close on the purchase. We’re talking pirate ships, netting, ocean, etc. 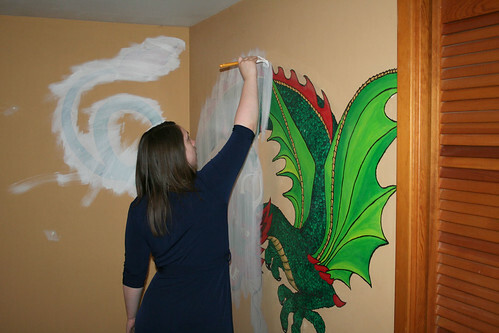 Bedroom 2 was painted in lime green with scooby doo painted all over the room in various scenes. I wasn’t about to take that on myself!